Alfred Hugh Philip Witcomb, known as Hugh, was born in Yeovil in early 1893, the son of brewer Philip Witcomb (b1844) and Annie Kate née Lush (b1863). Philip and Annie had a daughter Annie Kate Mary born in Yeovil in 1898 but by 1901 the family had moved to Frome (Philip's birthplace) and were living in The Cottage, Garston Lane, Frome, with two servants. By the time of the 1911 census the family were still at the same address. Philip had retired and was listed as living on private means. 18-year old Hugh, listed as Alfred, was a student. Hugh enlisted at Frome, joining the Machine Gun Corps. His Service Number was 32296. The date of his enlistment is unknown but must have been after October 1915 when the Corps was first formed, as described below. In 1914, all infantry battalions were equipped with a machine gun section of two guns, which was increased to four in February 1915. The sections were equipped with Maxim guns, served by a subaltern and 12 men. The obsolescent Maxim had a maximum rate of fire of 500 rounds, so was the equivalent of around 40 well-trained riflemen. The experience of fighting in the early clashes and in the First Battle of Ypres had proved that the machine guns required special tactics and organisation. On 22 November 1914 the BEF established a Machine Gun School at Wisques in France to train new regimental officers and machine gunners, both to replace those lost in the fighting to date and to increase the number of men with MG skills. A Machine Gun Training Centre was also established at Grantham in England. On 2 September 1915 a definite proposal was made to the War Office for the formation of a single specialist Machine Gun Company per infantry brigade, by withdrawing the guns and gun teams from the battalions. They would be replaced at battalion level by the light Lewis machine guns and thus the firepower of each brigade would be substantially increased. The Machine Gun Corps was created by Royal Warrant on 14 October 1915 followed by an Army Order on 22 October 1915. The companies formed in each brigade would transfer to the new Corps. The MGC would eventually consist of Infantry Machine Gun Companies, Cavalry Machine Gun Squadrons and Motor Machine Gun Batteries. The pace of reorganisation depended largely on the rate of supply of the Lewis guns but it was completed before the Battle of the Somme in 1916. The Heavy Section of the Machine Gun Corps was formed in March 1916, becoming the Heavy Branch in November of that year. Men of this branch crewed the first tanks in action at Flers, during the Battle of the Somme in September 1916. In July 1917 the Heavy Branch separated from the MGC to become the Tank Corps, later called the Royal Tank Regiment. It was probably at this time that Alfred transferred to the Tank Corps, with the new Service Number 206163. He served in 'G' Battalion (re-titled 7th Battalion in 1918). 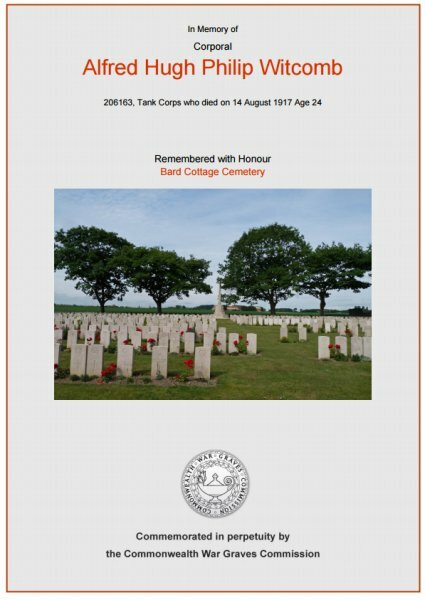 Sadly Alfred was not a member of the Tank Corps for very long as he was killed in action on 14 August 1917, aged just 24. 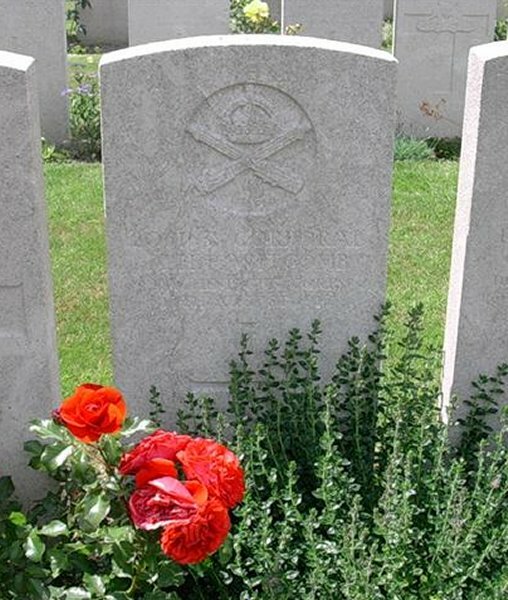 This short period in the Corps probably accounts for the Machine Gun Corps badge on his gravestone, rather than the Tank Corps badge. Although Alfred's battalion is not known, from where he was buried it is clear that he was in action on the Ypres Salient. Alfred Witcomb was buried in the Bard Cottage Cemetery, West-Vlaanderen, Belgium, Grave IV.C.20. His name is recorded on the War memorial in the church of St John the Baptist, Frome,(see Gallery) as Hugh Witcomb. His name was added to the War Memorial in the Borough in 2018. The Commonwealth War Graves Commission certificate in memory of Alfred Witcomb. Alfred Witcomb's Commonwealth War Graves Commission headstone at Bard Cottage Cemetery, West-Vlaanderen, Belgium. Note the badge of the Machine Gun Corps rather than the Tank Corps.